View presentations and videos below. Education: How can mayors help reduce the achievement gap and get every child a great education? Working with Allies: How can you work successfully with groups outside of city hall to advance your agenda? Energy Efficiency: What does it take to truly be an energy efficient city? Suzanne Donovan, Step Up Savannah, Inc.
1776 is a startup hub in downtown Washington that is home to over 180 startups and also contains a training facility, event space, and a media arm. Most of the startups at 1776 are bringing change to regulated industries like smart cities, clean tech, health care, and education. The Mayor’s office of Washington DC was instrumental in launching 1776. The tour will be led by David Zipper, formerly of the Washington DC Mayor’s Office, now with 1776. How can mayors help reduce the achievement gap and get every child a great education? Full Briefing Book Here. How can you work successfully with groups outside of city hall to advance your agenda? Full Briefing Book Here. How cities are taking a comprehensive approach to fighting poverty. Full Briefing Book Here. What does it take to truly be an energy efficient city? Full Briefing Book Here. Joint Use of Public Schools: A Framework for a New Social Contract, Mary Filardo, Jeffrey M. Vincent, Marni Allen, and Jason Franklin, 21st Century School Fund and Center for Cities and Schools, University of California - Berkeley, April 1st, 2010. Read more. Opportunity Rich Schools and Sustainable Communities: Seven Steps to Align High Quality Education, Deborah McKoy, Jeffrey Vincent, and Ariel Bierbaum, What Works Collaborative, Center for Cities and Schools, University of California - Berkeley, June 1st, 2011. Read more. Better Together: Building Local Systems to Improve Afterschool, The Wallace Foundation, January 1st, 2013. Read more. Sprockets 2011-2012 Out-of-School-Time Report, Sprockets. Read more. Saint Paul’s Right Track Initiative Information Sheet, City of Saint Paul, MN, January 1st, 2014. Read more. Education Initiatives Overview, Office of Mayor Chris Coleman, City of Saint Paul, MN, January 1st, 2014. Read more. 5 by 5 Program Replication Manual, City of Denver, CO. Read more. Cities Develop New Strategies for Reengaging Dropouts, Boosting High School Graduation Rates, Clifford M. Johnson, National League of Cities, December 10th, 2012. Read more. On the Road to School Success, Michael Hancock, Kevin Johnson, Angel Taveras and Julián Castro, Politico, October 15th, 2013. Read more. Vision and Goals, Denver Education Compact, City of Denver, CO. Read more. PLUS Leadership Initiative: Final Report, Deborah McKoy and Ariel Bierbaum, The Center for Cities and Schools, University of California - Berkeley, November 1st, 2012. Read more. Youth Master Plans Guide Action in Nashville, Grand Rapids, and Berkeley, Michael Karpman, National League of Cities, November 15th, 2010. Read more. Summary of Highlights from 2011-2012 School Year: 2020 Vision for Berkeley’s Children & Youth, City of Berkeley, CA. Read more. 2020 Vision Indicators: Tools for Guiding Our Work and Measuring Our Progress, City of Berkeley, CA. Read more. Promising Practices to Improve Schools and Communities, Heather Kinlaw, Deborah McKoy, and Jeffrey Vincent, The Center for Cities and Schools, University of California - Berkeley, July 1st, 2007. Read more. Tom Bates brings a lifetime of public service to the Mayor’s office – including four years as an Alameda County Supervisor, two decades as a California legislator, and 11 years as Berkeley’s Mayor. During Tom Bates’ 20 years as a State Assemblyman he passed and had signed into law 220 bills. He served on the Assembly Environment Committee for 19 years and consistently had a 100 percent environmental voting record; Bates also chaired the Human Services Committee for 14 years. He passed legislation for children and families, the environment, civil rights, and transit villages. Since becoming Mayor in 2002, a short list of Bates’ record includes: the establishment of the David Brower Center, the Ed Roberts Campus, Berkeley City College, the relocation of Freight and Salvage Coffeehouse, and the Tom Bates Regional Sports Complex. With others he started Berkeley’s Climate Action Plan, (consider by the United Nations as the best plan in North America), 2020 Vision for Berkeley’s’ Children and Youth (focused on eliminating health and education disparities), the East Bay Green Corridor, (includes 9 cities, UC Berkeley, Berkeley National Labs, Cal State East Bay and 2 Community College Districts) and Project Build (in its 9th year, teaching reading, nutrition and exercise). He serves on the Bay Area Metropolitan Transportation Commission, Bay Conservation and Development Commission and Bay Area Air Management District. Tom Bates is a native Californian and a graduate of the University of California, Berkeley ('61). During his time at Cal, Bates was a starting Member of the 1959 Cal Rose Bowl team. He is married to former Mayor of Berkeley and California State Senator Loni Hancock. Their family includes four children and seven grandchildren. Chris Coleman took office as Saint Paul’s Mayor in 2005 after several years as a city councilmember, community and neighborhood leader. Mayor Coleman’s sound fiscal judgment transformed a decades-long practice of balancing the city’s budget using one-time fixes and gimmicks into structurally-balanced budgets that use ongoing revenues for ongoing expenses. Mayor Coleman is currently the President of the National League of Cities, a national organization of city leaders across the United States. In 2012, Mayor Coleman was elected as the Second Vice President of National League of Cities, and became the League’s Vice President in 2013. Under Mayor Coleman’s terms, Saint Paul’s downtown has seen a revitalization. As light rail construction has progressed and more restaurants and entertainment venues have moved in, demand for housing has increased exponentially and downtown’s vibrant culture has grown. Bridging the education gap for children has been at the core of Mayor Coleman’s agenda. Under Mayor Coleman’s leadership, Saint Paul has become a national leader in green initiatives and sustainable living. The city’s sustainable investments include retrofitting buildings for energy efficiency, equipping public places with solar panels and electric vehicle charging stations, and more. Mayor Coleman’s top priority has always remained the safety of all residents and visitors to Saint Paul. Committed to building world-class departments that set the standard for service to residents and community, Mayor Coleman continues to invest in emergency personnel and training, as well as improved technology to assist them in keeping our communities safe. Michael B. Hancock became Denver, Colorado’s 45th mayor in July 2011 and immediately began to transform Denver into a globally competitive and connected city. With the fifth-busiest airport in the United State serving more than 53 million passengers per year, Mayor Hancock is leveraging Denver International Airport to make the entire Denver region a major gateway to the world. To help the Denver area compete in the global marketplace, Mayor Hancock also is working to create a bustling Airport City and Aerotropolis, which will create more than 30,000 new jobs over the next 20 years. The first phase of these initiatives includes a new 500-room hotel and transit center at the airport, as well as a 20-mile rail line linking Downtown Denver with Denver International Airport. Mayor Hancock also worked with regional leaders to secure a new U.S. Patent and Trademark Office in Downtown Denver. The Mayor has also developed strategic short- and long-term business plans to support and grow Denver’s diverse, intelligent and forward-leaning businesses in emerging industries such as clean energy, bio-technology, telecommunications, aerospace and healthcare. Mayor Hancock has driven bold, smart financial stewardship to make Denver a responsible and desirable private-sector partner. He has maintained a balanced City budget, strong financial reserves and a Triple A credit rating. Mayor Hancock has also brought meaningful reform to the Denver Police Department by establishing new leadership that has reorganized the department to get highly trained officers out of the office and back onto the streets. Prior to becoming Mayor, Michael Hancock served on the Denver City Council for eight years, including two as City Council President. In his early career, he worked for the Denver Housing Authority and National Civic League, and was the youngest President of an Urban League chapter in America. Deborah L. McKoy is the Executive Director and Founder of the UC Berkeley Center for Cities and Schools at the Institute of Urban and Regional Development and a lecturer in the Department of City and Regional Planning and the Graduate School of Education. Her research and teaching focuses on the intersection of educational reform, urban & metropolitan planning, community development and public policy. Central to her work is the critical role young people play in urban and metropolitan change and transformation. Related publications include: The Mechanics of City-School Initiatives: Transforming Neighborhoods of Distress & Despair into Neighborhoods of Choice & Promise; Housing and Education: The Inextricable Link, in Segregation: The Rising Costs for America; and Engaging Schools in Urban Revitalization: The Y-PLAN (Youth – Plan, Learn, Act, Now!). For nearly two decades, Deborah’s work has bridged the worlds of research, policy and practice, including a wide range of professional experiences: Consultant to the US Department of Housing and Urban Development (HUD); Chief of Economic Development at the NYC Housing Authority; Director of Refugee Services for CAMBA, a NYC non-profit organization; and Consultant to the United Nation’s Education For All initiative. Deborah has a Master’s Degree in Public Policy and Administration from Columbia University and a Ph.D. in Educational Policy with a specialization in Urban Planning from UC Berkeley. Wage Theft Ordinances in Florida, January 1st, 2014. Read more. Fact Sheet: The Utah High Quality Preschool Program, Goldman Sachs, J.B. Pritzker, and United Way. Read more. Making Utah the Best Place for Business and Kids, Karen Crompton and John Milliken, The Salt Lake Tribune, November 9th, 2013. Read more. Project Overview: Results‐Based Financing Proof of Concept, United Way of Salt Lake, Voices for Utah Children, Park City School District and Granite School District, July 9th, 2013. Read more. Jersey City’s Smart Push for Paid Sick Days, Star-Ledger Editorial Board, September 5th, 2013. Read more. Jersey City May Require Paid Sick Leave, Kate Zernike, The New York Times, September 3rd, 2013. Read more. City Ordinance 13.097, Jersey City, NJ, September 25th, 2013. Read more. Can Eminent Domain Be Used to Avert a Foreclosure Mess? This California City Thinks So, Mark Andrew Boyer, Yes Magazine, October 18th, 2013. Read more. More Cities Consider Using Eminent Domain to Halt Foreclosures, Shaila Dewan, The New York Times, November 15th, 2013. Read more. Local Principle Reduction Model Resolution, Alliance of Californians for Community Empowerment. Read more. Plan to Preserve Homeownership, Reset Mortgages & Aid Local Economies, Alliance of Californians for Community Empowerment, August 1st, 2013. Read more. Eminent Domain Statement of Principles, Alliance of Californians for Community Empowerment. Read more. Richmond Cares FAQ, Alliance of Californians for Community Empowerment, September 1st, 2013. Read more. Richmond Adopts Eminent Domain Mortgage Plan, Alejandro Lazo, Los Angeles Times, July 30th, 2013. Read more. Karen Crompton joined Voices for Utah Children in 2001. She is an experienced executive and change maker, who has developed, led and managed local, state and national level efforts to benefit children and families. She has hands-on experience in growing and sustaining an organization, forging partnerships, designing awareness campaigns, influencing public policy, mobilizing advocates, generating funds, managing grants, working with the media and planning events; proven ability to analyze needs, identify trends and opportunities, and develop innovative, effective solutions for enhancing programs and systems. Ben McAdams was sworn into office as Salt Lake County Mayor on Jan. 7, 2013. Mayor McAdams pledged to work collaboratively, across party lines, to find efficiencies in County government and to be open and accountable to citizens. Mayor McAdams is a former Utah State Senator. His legislative record includes strengthening child safety standards and consumer protections, eliminating housing and employment discrimination and increasing funding for mass transit. Mayor McAdams is a corporate finance attorney who practiced law with firms in New York and Salt Lake City, where he represented clients in complex public and private securities transactions. That expertise assisted his strategic relationships involving management issues between 16 municipalities and cities within Salt Lake County. Gayle McLaughlin was elected to her first term as Mayor of the City of Richmond, CA in November 2006 and was re-elected in November 2010. As Mayor of Richmond, Gayle signed four consecutive balanced budgets that kept and expanded City services and increased the number of police officers on duty by 18% since she took office. Violent crime and property crimes, still very serious problems in Richmond, have shown significant declining trends during her tenure. Under Gayle’s leadership, even with the current national economic downturn, over 700 new businesses opened shop in Richmond, creating over 1,000 jobs. As chairperson of the Richmond City Council, she has promoted a more participatory, democratic and transparent local government. Gayle’s successful election to the Richmond City Council in 2004 and to the Office of Mayor in 2006, without a penny of corporate money, marked a turning point in Richmond politics, when voters selected a candidate solely on the power of her ideas and values, rather than the power of wealthy special interests. Amy Schur is the Campaign Director of the Alliance of Californians for Community Empowerment (ACCE). ACCE is a grassroots community organization in low and moderate income neighborhoods in eight counties across California. Amy is the lead organizer coordinating the grassroots Campaign to Restore Community Wealth in Richmond, California, working hand in hand with the Mayor of Richmond and a broader coalition. This foreclosure and blight prevention effort utilizes eminent domain to acquire troubled mortgages and fix them. Before launching ACCE in 2010, Amy was the Head Organizer of California ACORN. Amy has worked as a community organizer on the South side of Chicago, in Detroit, and in cities across California. During the 21-year span of her organizing career to date, Amy has worked with community leaders on a range of successful issue and civic engagement campaigns, including a statewide tenants rights effort that led to passage of strong slum housing protections, a housing campaign that passed anti-predatory lending laws in several cities and at the state level, and a powerful fight in LA County that stopped many of the abuses of the Workfare (type of welfare to work) program. Cities Launch Anti-Poverty Centers, J.B. Wogan, Governing, July 30th, 2013. Read more. Shared Prosperity: Our Plan to Fight Poverty, City of Philadelphia Mayor’s Office of Community Empowerment and Opportunity, December 31st, 1969. Read more. Eva Gladstein serves as Executive Director of the Mayor’s Office of Community Empowerment and Opportunity for the City of Philadelphia. The focus of agency, recently formed by Mayor Michael Nutter, is to align the City’s efforts to lift individuals and communities out of poverty and increase opportunities for low income individuals and families. Gladstein previously served as Deputy Director of the Philadelphia City Planning Commission and recently completed a three-year assignment as Executive Director of the 31-member Philadelphia Zoning Code Commission, successfully reforming and modernizing Philadelphia’s 50-year old zoning code. She also served as the Director of Neighborhood Transformation for former Mayor John F. Street, coordinating a multifaceted strategy designed to renew and strengthen entire communities. Prior to being appointed to this position, Gladstein served as the Executive Director of the Philadelphia Empowerment Zone under Mayors Street and Rendell for close to seven years. She began her career in the mid-1970s, co-founding and directing several non-profit organizations. She lives in Philadelphia and has been active on the Boards of a variety of civic associations. Jodie Levin-Epstein is Deputy Director of CLASP, the Center for Law and Social Policy, a national non-profit organization which promotes policy solutions that work for low income people. She has played a key role in the re-emergence of poverty and opportunity in recent public discourse. Jodie manages a national initiative, Spotlight on Poverty and Opportunity: The Source for News, Ideas and Action an award-winning web-based resource that provides both a big tent for conversation and a one stop shop for research and reports. Her report Seizing the Moment: State Governments and the New Commitment to Reduce Poverty revealed the stunning growth in state efforts to raise the political profile of poverty and opportunity. Her paper, Target Practice: Lessons for Poverty Reduction highlighted how environmental and housing metrics which set goals and timelines have moved those issues forward. She has provided technical assistance to a variety of state poverty commissions and advocacy organizations. And, she can be seen on occasion on C- Span interviews and MSNBC. In 2009 she received an honorary doctorate of laws from Grinnell College in Iowa. Suzanne Donovan has been communications and policy director at Step Up Savannah, Inc. since June 2007. She joined the organization after spending four years as assistant metro editor at the Savannah Morning News, where she supervised reporters covering crime, courts, politics, the military and religion. Donovan has an eclectic range of professional experience—from several years at the Graduate School of Journalism, U.C. Berkeley to several more years in Texas, where she was executive director of 2 non-profit groups, including the ACLU of Texas, then co-authored a book on Texas Death Row, to news reporting and editing. She earned a Masters degree in Journalism from U.C. Berkeley in 1982. Dallas Strengthens Green Building Code, Brandon Baker, EcoBusiness, October 29th, 2013. Read more. County Council Leads Investment in Low Carbon Future, Clare Taylor, Sustainable Cities Collective, November 15th, 2013. Read more. Cities and the Competition for Energy Efficiency, Bob Graves, Governing, March 25th, 2013. Read more. Chapter 47: Energy and Air Pollution, Code of Ordinances, Minneapolis, MN. Read more. Cooling Los Angeles, from the Roof Down, Anna Bergren Miller, AN Blog, January 2nd, 2014. Read more. 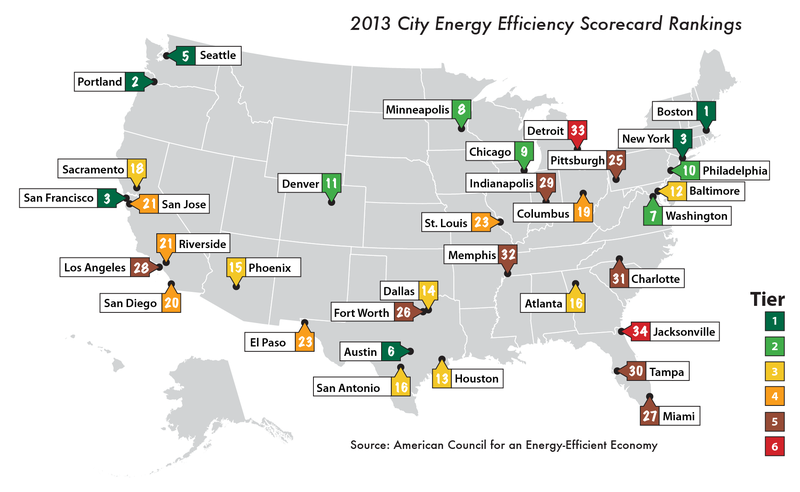 The 2013 City Energy Efficiency Scorecard, American Council for an Energy-Efficient Economy, September 1st, 2013. Read more. The Local Energy Efficiency Self Scoring Tool, American Council for an Energy-Efficient Economy. Read more. Scorecard map, American Council for an Energy-Efficient Economy. Read more. Executive Summary: City Energy Efficiency Scorecard, American Council for an Energy-Efficient Economy, September 1st, 2013. Read more. Mayor Charlie Hales serves as the current Mayor of Portland, OR, having taken office on January 1, 2013, and previously served on the Portland City Council from 1993 to 2002. He earned his degree in political theory from an honors program at the University of Virginia. After moving to the Portland area, Charlie went to work for the Homebuilders Association of Metropolitan Portland and raised a family in Northeast and Southwest Portland. But, both at work and in the community, he began to detect hints of the sort of shortsighted development he thought he’d left behind back East. That led to Charlie’s 1992 run for City Council. “Almost nobody knew my name,” he recalls, “and I didn’t have a great deal of money. So I had to introduce myself – one voter at a time.” The message at more than 20,000 doors was straightforward: “Portland is about to grow and how we grow is very important.” Charlie was elected that year and twice more. At the Transportation Bureau, Charlie Hales championed light rail expansion, streetcar development and safe bicycle routes to reduce traffic congestion and improve the environment. At the Parks Bureau, he inspired the first successful bond measure in half a century, then leveraged the funds to raise enough additional money to build or renovate 110 parks in every area of the city. A decrepit community center in Mount Scott was repaired and outfitted with a swimming pool, the Peninsula Park Center in North Portland was restored, and new community centers rose in East Portland and Southwest Portland. Charlie left office in 2002 when a nationally prominent engineering firm asked him to replicate some of his successful mass transit efforts in cities around the country. As Senior Vice President for Transit Planning at HDR, Inc., he has studied, instituted and managed projects in Cincinnati, Dallas, Los Angeles, Miami, Sacramento, Salt Lake City and Scottsdale. Charlie left Portland for a few years after marrying his wife, Nancy, whose two children were still in high school in Stevenson, Washington. Nancy Hales directs First Stop Portland, a program within Portland State University that develops programming and field studies for visiting delegations interested in learning about Portland’s urban sustainability. Charlie is on the boards of Friends of Trees and the Portland Parks Foundation. He has been a SMART reader, volunteered at Meals on Wheels and served on the Portland Public Market Committee. His work has been honored by the Bruner Foundation for Urban Excellence, the American Society of Landscape Architects, the Oregon Chapter of the American Planning Association, the League of Oregon Cities and the Portland Bicycle Transportation Alliance. Barry Hooper is the Green Building Coordinator for the City of San Francisco, CA. The Green Building Team at the San Francisco Department of Environment’s supports the City & County of San Francisco’s goals to enhance the built environment for the benefit of the community, economy, and ecology. Barry Hooper is responsible for policies, building codes, incentives, and public information efforts supporting facilities and homes owned by the private sector in San Francisco. His current projects include local requirements for existing commercial buildings to obtain energy audits and report energy performance ratings, as well as the Green Building Ordinance for new construction. Prior to joining SF Environment, Barry served as Green Building Coordinator for the City of San Jose and managed the Silicon Valley Energy Watch energy efficiency program. He earned master’s degrees in Environmental Science and Management, as well as Geography, from the University of California at Santa Barbara. Eric Mackres leads the local government and community energy efficiency initiatives of the ACEEE Policy Program. He provides technical assistance to communities that are beginning or expanding energy efficiency efforts. In addition, he manages ACEEE research related to local implementation of energy efficiency. Eric is the lead author of the first City Energy Efficiency Scorecard published in 2013. Eric has led ACEEE projects related to joint water-energy efficiency programs, efficiency in multifamily housing, economic development, location efficiency, and program potential analysis. Prior to joining ACEEE in 2010, Eric worked in environmental organizing with the StatePIRGs in Michigan and on state-wide affordable housing policy in California. His master’s research focused on partnerships for local energy efficiency implementation in Massachusetts. Eric earned a Master of City Planning and Certificate of Environmental Planning from the Massachusetts Institute of Technology and a Bachelor of Arts in Political Science from Albion College. Suzanne Donovan, Deputy Director, Communications & Policy, Step Up Savannah, Inc.